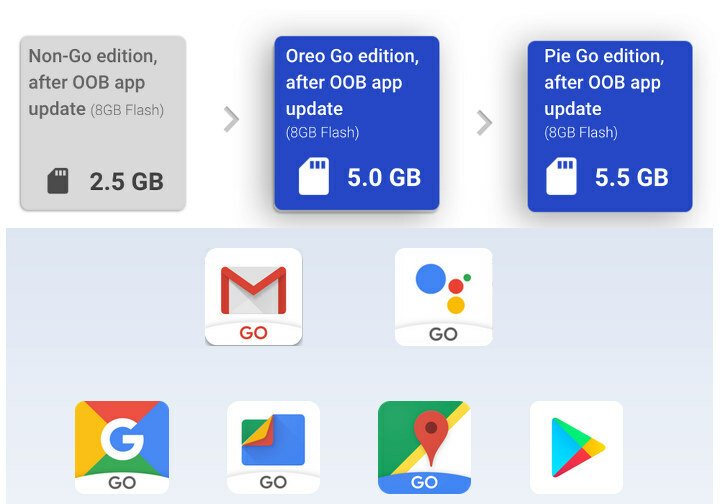 Android Go Edition was first launched with Android 8 (Oreo) in order to provide an operating systems and Google apps optimized for low-end hardware with less than 1GB RAM. Since then more than 200 Android Go smartphones have been introduced in over 120 countries for as low as $30. Follow the release of the “full” Android 9.0 Pie operating system last week, the company has now announced Android 9 Go Edition with several new features. Up to 500MB extra storage – So as shown above you may have 5.5GB free instead of 5.0 GB in Android 8 in a phone with an 8GB flash. The company also made several improvements to Google Go apps with for example, Google Go being able to read webpages aloud, Google Maps Go supporting navigation with turn-by-turn directions, or Assistant Go adding support for Spanish, Brazilian Portuguese and Indonesian, as well as Bluetooth, camera and flashlight control. If you’ve gotten an Android 8 Go edition device, I’m not sure you can expect an OS upgrade like you would with devices part of the Android One for example, but I’d expect you to benefit from Google Go apps. Android 9 Go Edition smartphones are expected to launch later this fall. GMaps Go is basically a browser with low-spec mobile view! Dunno about the other apps on Android Go. Hard to understand why boot time would matter. You only boot a phone every few weeks. Seems like premature optimization.